The Health On the Net Foundation is not responsible for, nor can it control, any aspect of the content of Web pages other than its own (view the disclaimer). Before following any medical advice or buying any medical product or service on-line, we strongly urge you to consult a physician directly. If your care providers are users of the Internet, ask them what they think of Web sites that you use or are thinking of using. Web sites interested in long-term success have an important incentive to conform to high ethical standards. And HON will continue to improve the scope and efficiency of its code of conduct, in line with our belief that responsible voluntary regulation by medical information providers on the Internet is good, necessary and effective. Users who come across a Web site of dubious quality, which violates one or more of the HONcode principles while displaying the HONcode seal, should report the violation using the complaint system accessible via the HONcode certificate linked to this Web site, or if the HONcode certificate is invalid by e-mail directly to the following address: or by our complaints system. The complaint should clearly show how one or more of the HONcode principles is not respected. If the Web site does not reply in a satisfactory manner within 15 days, and if HON judges the user's concerns to be justified, the offending Web site will receive a warning by e-mail from HON. The message may suggest modifications and will set a deadline for compliance. If satisfactory modifications are not made by the given deadline, HON may ask the Web site to remove the HONcode seal and all related text from its pages. HON will also delete the site's registration from the HONcode ID index. HON may also request the removal of the HONcode logo and all related text from a website, in the case of suspension or withdrawal of certification. All webmasters are legally bound (at the time of application) to comply with these requests, failing which, HON may take legal action against such persons. 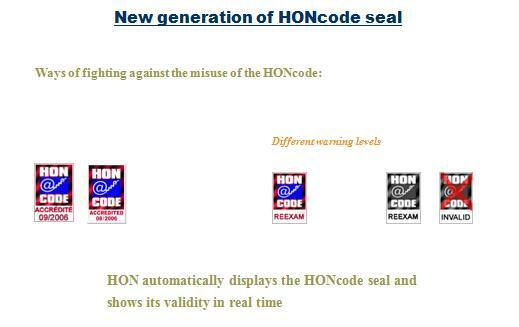 Failure by that Web site to remove the HONcode seal and all related text from its pages will result in HON changing the seal status into “invalid”, and adding the site in a not bona fide list. Users clicking on an "Invalid" HONcode seal on any site will know that the site is not or no longer in compliance with the HONcode, and should notify us by e-mail at . If the seal is not removed within the time frame requested, HON also has the right to take legal action against such parties, and will do so where and when necessary.